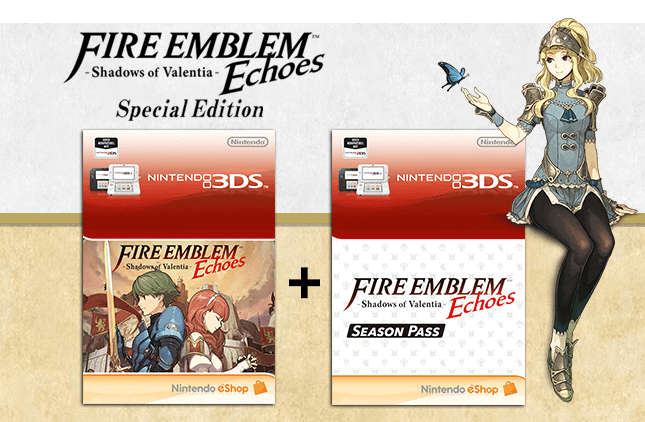 - Fire Emblem Echoes: Shadows of Valentia: Season Pass as an eShop code, which contains DLC Pack #1 up to #5. - Free DLC: Mila’s Bounty - The goddess Mila will offer adventurers special gifts. Be sure to connect to the internet and check for downloads. 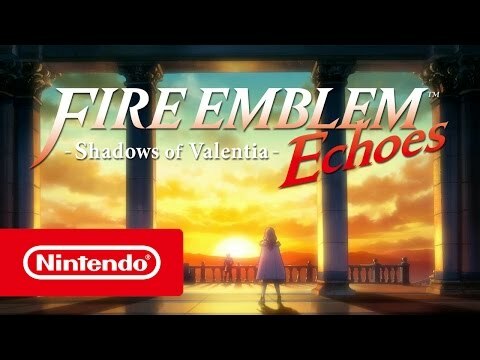 Inspired by Fire Emblem Gaiden, which released exclusively in Japan in 1992, Fire Emblem Echoes: Shadows of Valentia recreates classic Fire Emblem gameplay with a modern twist, mixing in exploration of towns and dungeons. Dual protagonists Alm and Celica will join others locked in a tragic war dividing the continent of Valentia. Conflicts will come to life in cut scenes created by Studio Khara and every line of dialogue has been fully voiced. Free-roaming, dungeons crawling with enemies, flexible character progression – everything that made Fire Emblem Gaiden unique is present in Fire Emblem Echoes: Shadow of Valentia, only on Nintendo 3DS family systems. By purchasing the Season Pass, fans who want to receive all the DLC content will save over 30% compared to purchasing all 22 pieces of content on their own. DLC Pack #1 – Fledgling Warriors Pack (19th May, £7.19 / €7.99, three pieces of content): Ideal for gamers who are in the early to middle stage of the story, this pack includes a new dungeon (The Astral Temple) and two new battle maps – one ideal for gaining more silver coins, and the other ideal for earning more experience points. DLC Pack #2 – Undaunted Heroes Pack (Content available from 25th May, £8.99 / €9.99, three pieces of content): In addition to a new dungeon (The Inner Sanctum), this pack also includes two new challenging battle maps suited for stronger, more seasoned heroes – one ideal for battle-hardened heroes to earn more experience, while the other will help players earn even more gold. DLC Pack #3 – Lost Altars Pack (Content available from 25th May, £13.49 / €14.99, 10 pieces of content): The mysterious dungeons included in this pack hold the power to upgrade characters to exclusive classes that don’t appear in the main game, allowing them to reach even greater heights of power and greatness. DLC Pack #4 – Rise of the Deliverance Pack (Content available from 1st June, £11.69 / €12.99, four pieces of content): Discover the previously-untold history of Valentia in this Prologue pack. Complete with brand new story content and additional voice acting that details the rise of the Deliverance in Zofia, this collection of challenging maps includes new support conversations between selected heroes, as well as the ability to take command of a character players won’t be able to control in the main game. DLC Pack #5 – Cipher Companions Pack (Date content is available to be revealed at a later date, £4.49 / €4.99, two pieces of content): New heroes from Fire Emblem Cipher, the popular Japanese trading card game, will become available for recruitment in Fire Emblem Echoes: Shadows of Valentia. More information about this final DLC pack will be revealed in the future.